No matter how healthy you are, during the winters, everyone wanders a little away from their healthy lifestyle. But the Health and Nutritional Boost bundle can help your special ones feel and look their best after a massive indulgence! 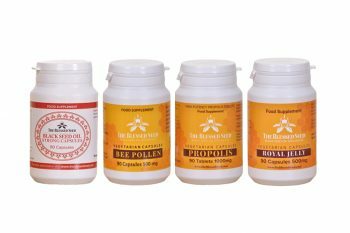 The best thing about this bundle is that it doesn’t just contain halal black seed oil capsules but also vegetarian royal jelly capsules and vegan bee pollen capsules. And that’s not it! You also get propolis tablets that are known for their use in Chinese and Incan medicine for wounds, fevers, ulcers, etc. Now you can buy our strong black seed oil in capsule form. Although many people prefer to take the oil straight from the bottle, there are many advantages to getting capsules instead. Caps are undeniably more expensive than the bottled oil but they are also much more convenient and easier to use. If you are travelling, the capsules are completely fuss and mess free. The other advantage of taking the oil in capsule form is that it is much easier to adjust the dosage because it is premeasured for you. 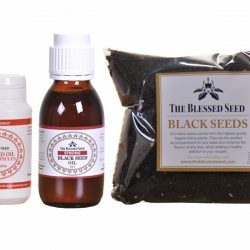 It is always wise to start small with black seed oil and increase the dose gradually, which is trickier with the bottled product. We advise those who are new to black cumin to use the mild oil as an introduction and work their way up to the strong oil. If you take the capsules, however, this is largely unnecessary unless you are extremely sensitive. In that case, you are advised to take the Mild Black Seed Oil Capsules. Black cumin oil has a distinctive taste that not everybody enjoys. It can leave a bitter aftertaste, which some people cannot get past and, of course, in the case of our strong oil, this problem is exacerbated. The capsules offer a convenient alternative to those who want to enjoy the many health benefits of black cumin oil but find it unpalatable. No other company has done the research that we have applied to this incredible product. The main healing properties are found in the volatile oils which can vary from 0.3% to about 5%. Most black seed oil on the market has a volatile oil content of 0.3% to about 1%. Thymoquinone is a part of the volatile oils, so as a rule, the higher the volatile oil content, the higher the thymoquinone content. Bee pollen is a perfect nutritional package, with more amino acids per weight than beef or eggs. It is a concentrated source of a wide variety of the nutrients necessary to maintain good emotional, mental and physical health. Besides being rich in essential amino acids, it contains carbohydrates, lipids and fatty acids, phenolic compounds, enzymes, coenzymes, vitamins, minerals, and trace minerals. It is one of the most abundant sources of the bioflavonoid rutin, which strengthens capillaries and is also high in ribonucleic acid (RNA) and deoxyribonucleic acid (DNA). Bee pollen has been found to be antifungal, antimicrobial, antiviral, hepatoprotective, immunostimulating and a potent anti-inflammatory. Professional athletes in Europe use bee pollen tablets to improve their performance because it significantly increases energy, stamina and strength. Used locally, it relieves pain and facilitates the granulation process necessary for the healing of burn wounds. Pollen is an effective treatment for allergies, especially if a regimen is begun six weeks before the start of the season. Bee pollen reduces the histamine responsible for the hay fever and congestion in allergy sufferers without the drowsiness that accompanies pharmaceutical antihistamines. It can be used for a wide range of respiratory diseases, from asthma to chronic sinusitis. Each tablet contains Propolis resins, equivalent of 1000 mg raw Propolis. Propolis is a remarkable natural product crafted by the humble bee. Without it, the beehive would not be able to function as propolis is part of the bee colony’s immune system. Propolis is the bee’s naturally produced antibiotic. Not surprisingly, propolis has been used since antiquity for its medicinal properties. The ancient Romans, Persian, Greeks, and Assyrians used it to treat wounds and Roman scholar Pliny (23-79 A.D) wrote that it “soothes pain of sinews and heals sores when it appears hopeless for them to mend.” The Chinese and Incans also used it for wounds, as well as fevers, ulcers, and toothache. The ancient Egyptians even embalmed their mummies with it, calling propolis the “secret to eternal health and life”. Research through the 20th century and beyond has confirmed the medicinal value of propolis, establishing it as a natural antibiotic with antiviral, antiseptic, anti-inflammatory, antioxidant, antimicrobial, antiulcer, and immunomodulatory properties. Studies testing it against 10 different types of cancer, from brain to skin, breast and colon cancer have shown it prevents the spread of cancer to other organs and inhibits the new blood vessel growth and cell division that enables tumors to grow. As a powerful antioxidant, propolis is an extremely useful supplement for good health. Used from ancient times, Royal Jelly has endured as a traditionally trusted, health promoting functional food. Folklore tells us it is good for general mental and physical well-being, menopausal symptoms and infertility. It has always been associated with royalty and the ancients treasured it – the Greeks for stamina, the Egyptians pharaohs for beauty and longevity, the Indian maharajas for keeping them full of youthful vigor, and the Chinese for preventing illness and prolonging life. In TCM (traditional Chinese medicine), royal jelly is known as the “food of the emperors”. Modern research has confirmed Royal Jelly’s multiple pharmacological activities as a hormone-balancing, antibacterial, antioxidant, antitumor, anti-allergy, anti-inflammatory, neuroprotective and immunomodulating agent. At least 185 different organic elements have been identified in Royal Jelly, including unique proteins like Royalisin, which has potent antibacterial properties at low concentrations. A gift from nature, Royal Jelly promotes shinier hair, stronger nails, softer skin and enhanced physical and mental health. It helps you fight fatigue and stress and can be considered an all-natural anti-aging supplement. Caution: Not for use by infants under 3 or individuals who are allergic to bee products.